"Bob Hope and Jackie Gleason request the honor of your presence at a swinging session on How to Commit Marriage." 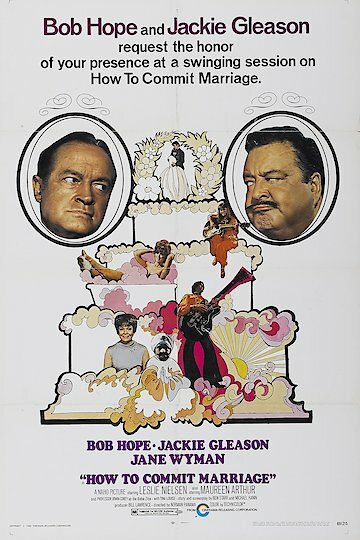 How to Committ Marriage is a 1969 comedy featuring a large cast. Bob Hope and Jackie Gleason star in the leading role, but the cast also includes Jane Wyman. Leslie Nielsen, Tine Louise, Irwin Corey and others, Tim Matheson makes his film debut in the movie. Hope plays Frank Benson and Wyman plays his wife Elaine. Their daughter wants to marry the son of a music promoter named Oliver Poe (Gleason). What the daughter does not know is that her parents are planning on getting a divorce. They are already dating other people. The movie is full of Hope and Gleason wisecracks, hippy dippy counterculture themes, and rock music. It is a funny farce about marriage and the sexes.